← Uncompromised Faith: A Call to Liberal Christians! SunTrust Is About To Find Out They Did Not Corner A Cat, They Cornered A TIGER! While on Twitter last week, my friend and Co host, Tallulah, saw a passionate plea for help. It was from a lady called Cat who has a blog describing her family’s real-life, waking nightmare: A Stay At Home Mom vs. TARP Recipient, SunTrust. Cat’s blog tells the story of how her family worked hard and sacrificed to achieve the American Dream, only to have it ripped from their hands by what Cat calls “fraud, lies, and , deception.” She says “the perpetrators of this insult include a scamming builder and criminally corrupt SunTrust.“ It is a most egregious story of loan mishandling, EQUITY STRIPPING, and predatory lending. Now along with being a stay at home mom, Cat has become an internet activist and researcher in her quest to get justice for her family. She has learned to blog and tweet and is now reaching out to the “New Media” for help. After speaking with Cat, Tallulah and I believe her story needs to be told and the truth found as to who is responsible for this assault on her family’s future. 1) Is this an instance of collusion between a loan officer and a builder or does it go deeper into management? Is this a case of horrific fraud? 2) Cat has found two other families with the same problem concerning the same branch of SunTrust and the same builder. Are there more of the same out there? 3) Cat also knows of 4 other families with similar problems with SunTrust involving different branches and different builders. Is the a culture of corruption throughout SunTrust corporate? How many more victims are out there? 4) With all of the proof that Cat has, why would SunTrust not right this injustice? There has to be a bigger reason to risk a huge lawsuit with dire financial consequences and including possible criminal charges. The Wekiva River — downstream from the Little Wekiva River — is a focus of federal protection efforts. U.S. Rep. Bill McCollum introduced legislation in August 1999 seeking to include the 42-mile-long Wekiva River in the National Wild and Scenic River system. Cat and her family are now in a huge financial bind after 5 years of trying to get this sorted out with SunTrust. They have made their loan payment on time and had the added expense for renting a house for 4 years. Their dream house sits vacant, incomplete, and deteriorating while SunTrust waits for them to go broke so they can take possession of the property. Now they hear that the landlord of their current residence is in foreclosure and when they are forced out of this home, they will not have the credit to buy or rent another. This entry was posted in Uncategorized and tagged corruption, deception, EQUITY STRIPPING, family, Fan The Fire, fraud, home, loan, loan mishandling, Patriot's Heart, predatory lending, SunTrust. Bookmark the permalink. 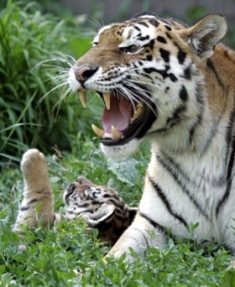 4 Responses to SunTrust Is About To Find Out They Did Not Corner A Cat, They Cornered A TIGER! While Cat is on your show, do make an appeal for an atty who will help. I’ve spent a good many years helping to defend white collar criminals and know, w/o a competent lawyer, they’re simply in over their heads.